ABAC Air Compressors – Portable Garage to Industrial Screw Compressors! ABAC Air Compressors are a specialist manufacturer of air compressors. The company started in Italy and continues to manufacture the majority of their compressors there. ABAC compressor was founded in 1980 by Antonio Balma who with over 60 years experience in the industry was regarded by many as the Father of compressed air - ABAC has grown into the strong and dynamic company of today that now heads the multi-national ABAC Group of companies. The ABAC Group is in fact the only manufacturer world-wide that is present in all three market segments (consumer, professional and industrial). In particular in the sector of piston compressors intended mainly for the consumer and professional market, the ABAC Group is the European leader with a market share of 40% and world-wide with a share of 15%. In the sector of screw compressors, intended for the industrial market, the Group is the fourth largest European manufacturer and ranks seventh world-wide. There are 2 lines of ABAC air compressors. “Blueline” – These are top of the range air compressors. Designed and built in Italy. “Redline” – They have slightly less features and the pump is manufactured in Italy. The Bluelines are more expensive, but are better value for money. 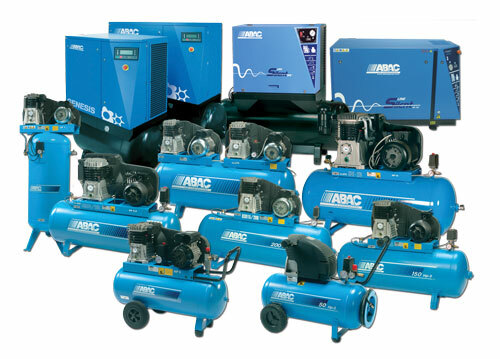 For the full range of ABAC air compressors, please click here.